HDPE pipe is lightweight, strong, and long-lasting. Sizes from 6" to 48" are available in 20.5' sections. Each pipe is manufactured to easily join sections together without the use of a separate coupler. HDPE pipe is DOT approved. We stock a large selection of various diameters and lengths. Sizes available are from 6" to 120" in diameter and 50' to 60' in length. 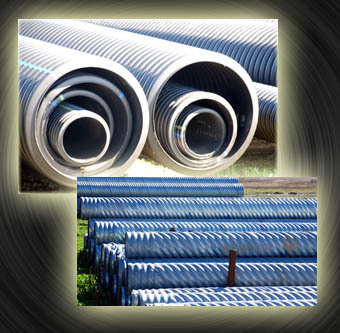 We also stock arched corrugated metal pipe in a wide variety of sizes to fit your needs. Trenchcoat film-coated pipe is ideal for abrasive or corrosive soil or water conditions. We stock multiple sizes of polymer-coated pipe for immediate delivery to your job site.